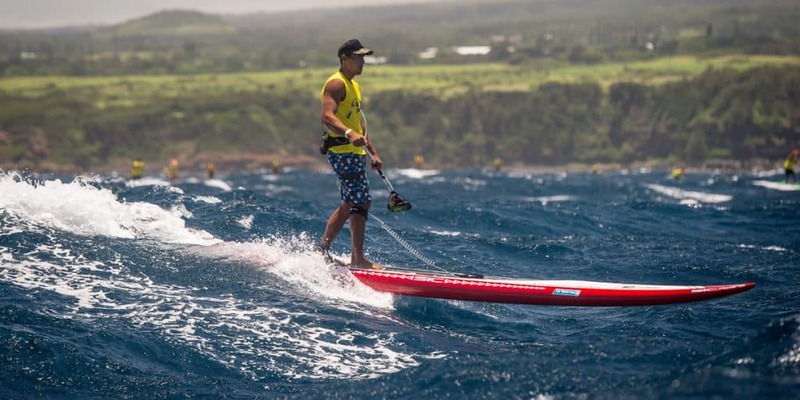 Home Features Techniques and Training What is the best fin for your SUP? GB SUPer Aaron Rowe showing off his thruster configuration. Here is the ultimate fin guide. The answer is….it depends! However, there are tips and tricks you can employ to make sure you get the most out of the pointy bit of technology sticking out of the bottom of your board. 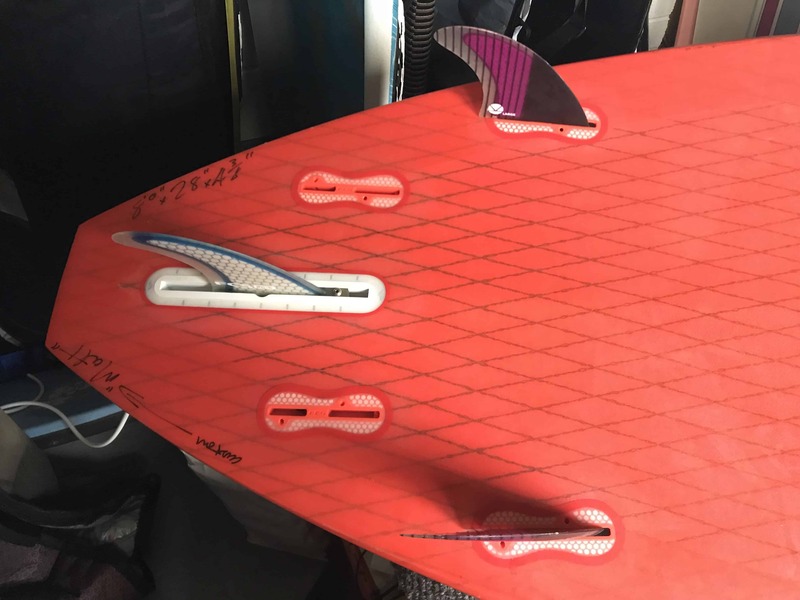 It has been said that your fin set-up can increase the performance of your board by up to 40%, so it pays to understand the options. What type of SUPing am I going to be doing? It is, of course, a fairly obvious questions. The fin sets you use for surfing are going to be completely different to a race fin. So let’s tackle SUP Distance first. Most race or distance boards have one single fin slot and come with a stock fin (such as a weed fin – so named as the fin is swept back and weed/seaweed shouldn’t get stuck around it). For most distance paddling the stock fin should be fine, however a couple of rules do help out. 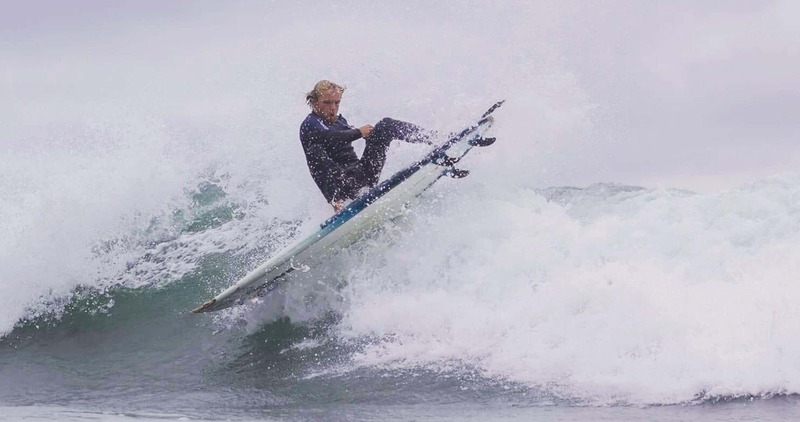 If you find your board “sliding” on the tail when you go over chop or when you are downwinding, it is worth considering a larger fin to help keep the board tracking correctly. It is also worth considering if you find your board unstable – a bigger fin will help. SIC Weed Fin, good for not picking up weeds & seaweed. Racing is a whole new ball game as competitors look for anything to give them an edge. Super light carbon fins, designed to keep you on the right track, and to resist things like side current and wind are worth looking into. If you are planning to take part in technical course racing, a shorter fin may give you the edge when it comes to turning about the buoys. Once again it is about experimentation and finding what is right for your board. 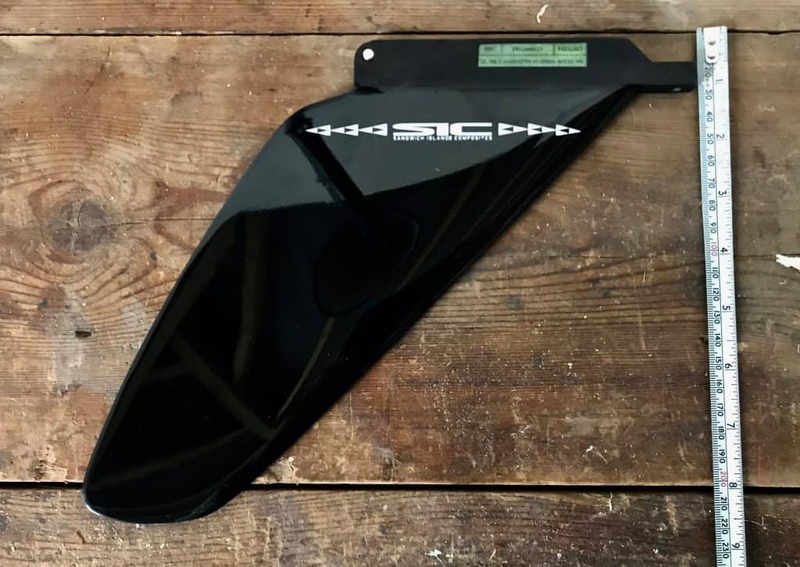 A warning about stock fins – they are rarely going to give you top performance, so it is definitely worth checking out a fin upgrade. FCS have a good selection so it is a good place to start. This is a developing side of the sport in terms of fins. At first, everyone ran a simple single fin, usually swept back like a longboard. On the bigger boards an option for the fin is to make it steerable like a rudder (check out SIC steerable boards). However, as riders started experimenting, 2+1s and quads have been seen out on the water. SUP downwinding is basically a distance/surfing crossover, so it is no surprise that surfing style fins work when catching bumps. So what do fins do? 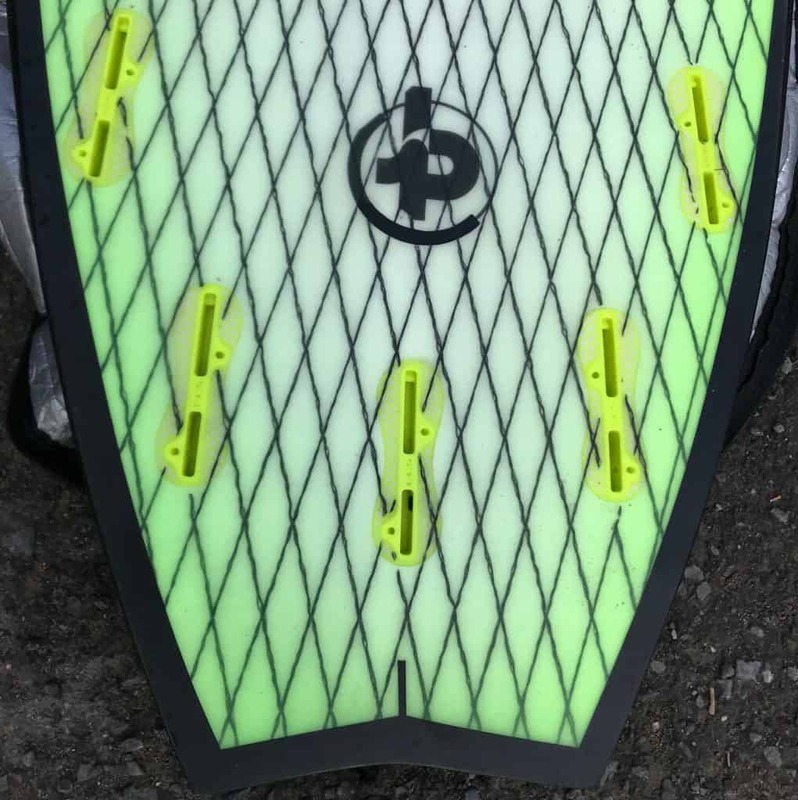 The obvious answer is that they keep the board tracking along the wave and stop it from sliding out, however they also have a large impact on how fast your board will go, how it turns and board stability. Most SUP surfboards come in one of three configurations: thruster (a set of two side fins and a centre fin), quad (two large side fins and two slightly smaller) and a single fin (larger than a thruster centre fin). Some may have five fin boxes on them, so you can run a thruster or a quad set up. Don’t fill all five boxes unless you have a knubster centre fin; that way lies the path to kookdom. Here is a truth about board design that the marketing materials won’t tell you: some manufacturers just chuck five fin boxes in as it makes for a great selling point, however unless the board has been carefully designed to run as a thruster and a quad, (which is pretty hard to do as both designs involve compromises), one or maybe both fin configurations will be sub-optimal. A board with five FSC II inserts. Don’t fill them all now! This is the classic Simon Anderson designed configuration which allows a good compromise between speed and manoeuvrability. 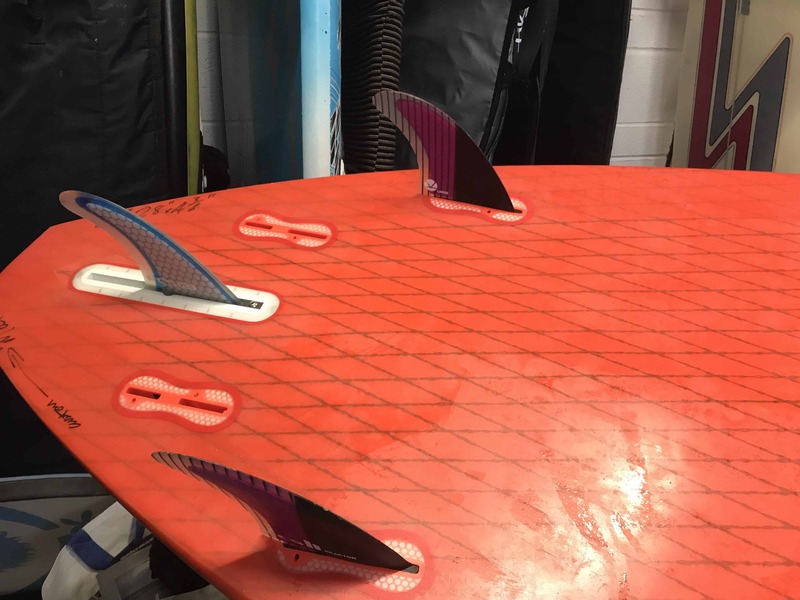 As you will discover, fins are a mixture of technology and rider feeling – lots of surfers love the feeling of a thruster set up. 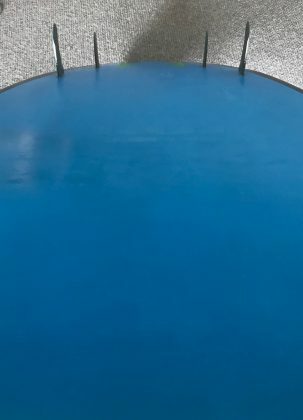 As you turn the board or hit the lip of a wave, it feels solid and you get a nice level of control under your feet, however you will have to pump and paddle the board to increase the speed. With SUPs you would think that, due to the larger board size and volume compared to surfboards, you need bigger fins, but I have not found that. I have been using FSC II mediums and larges on all my SUPs from 8ft 6 down to 7ft 6. I use the same sets of fins in my non SUP short surfboard and they all work fine. This is good news as it opens up a whole world of fin selection to you. FCS PC5 Centre Fin and FCS Performer Centre Fin, the performer is a snap in/out version - no tools required. Thruster set up with FSC II plugs and a longboard centre fin slot. Thruster set up with FSC II plugs and a longboard centre fin slot, to adjust the centre fin you need an allen key tool. A lot of SUPs have a longboard-style fin box for the centre fin rather than a FSC II or other snap-in style of box. 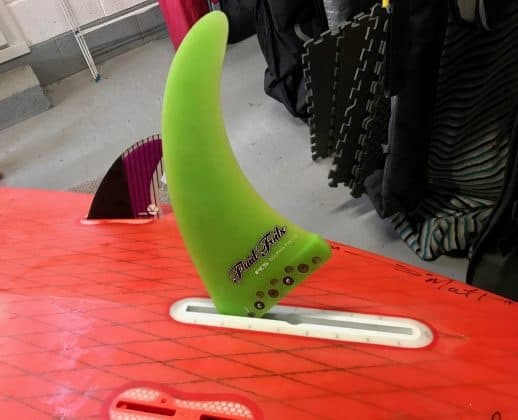 This is great news, as you can play with the position of the fin, especially if you have one of the new style bolt-less fins which you can adjust on the water. The big caveat here is to make sure it is tight in the fin box before you get into the water. I have lost one before while surfing as there was just a bit too much play in the box. 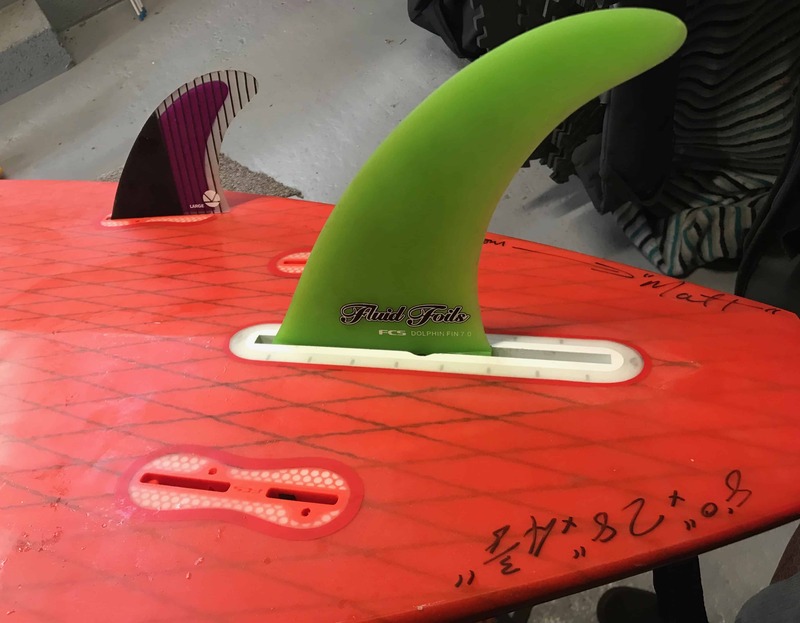 If you can find one, snap up a FSC Fluid Foil Dolphin Fin – they are rare, but they are a fantastic bolt-less fin. So where should you put the fin in the box? First off, put it as far forward as you can, surf a couple of waves, then put it as far back as you can and surf again. Feel the difference? 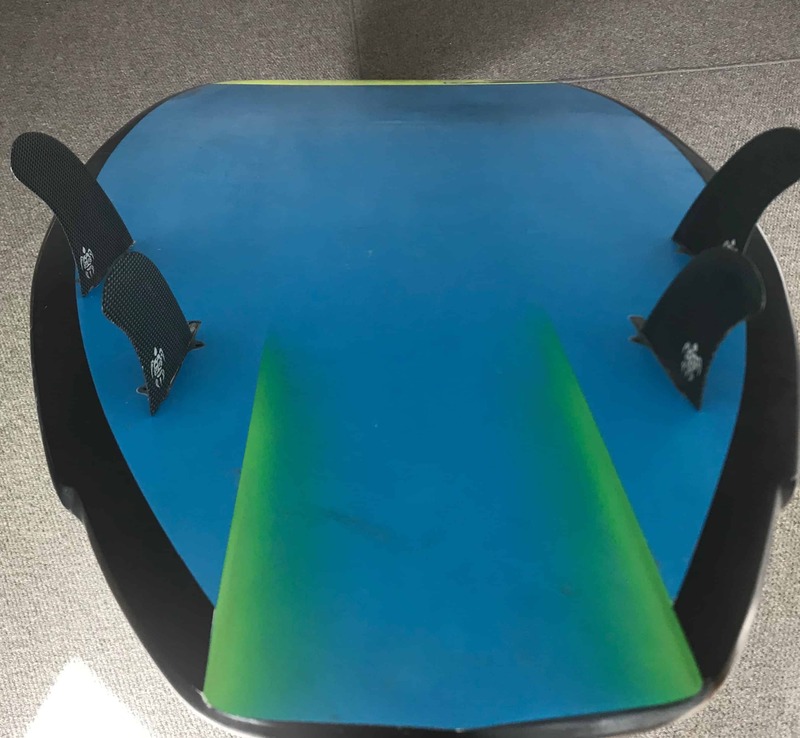 Although every board has its own characteristics, you should find that with the fin forward it becomes very loose and a bit prone to sliding out, but with the fin at the back of the box, the board should feel faster with more drive. Obviously the best position is somewhere in-between, depending on what you like. For me, I like to keep it flexible, for example if the waves are steep and fast I move it further back, but if it’s mushy or I am competing, I will move it forward. FSC Fluid Foils Dolphin Fin, locked back into the box. 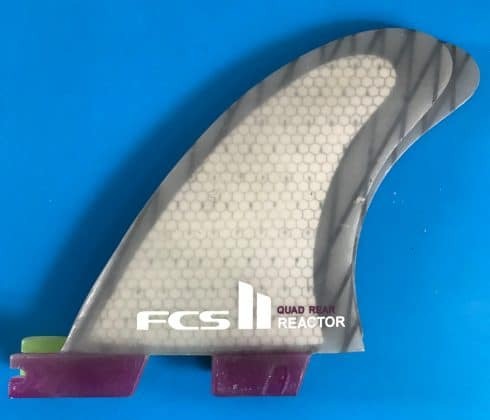 FSC Fluid Foils Dolphin Fin, you can push this forward and adjust its position in the box while surfing - great to see immediate differences for fin position. So this is my favourite for some very good reasons, but it comes with caveats. First off, your board has to be designed for a quad. Although you can whack quad fins into a five fin box board, and it will go faster, unless your shaper has designed the bottom contours and channels to work well with a quad, you won’t get the most out of it. I was stunned the first time I rode a board specifically designed for quads – the difference was huge. As you might have guessed, speed is a major factor with the quad and it is significantly faster than a thruster. To some extent you will be sacrificing manoeuvrability unless you have that specially-designed board. It does feel different to a thruster when turning or lip bashing and it doesn’t have that pivot-like sensation that a thruster gives you, but you can carry speed into turns. Another factor here is what wave you are going to be riding. My local break can produce slowish waves at low tide, so the quad gives me extra speed to make the most of these conditions. Quads are also used in big-wave riding or steep waves. The reason is that the four fins give you a lot of hold on a steep-faced wave, helping you to feel locked in. For a quad to really work well the board has to be shaped right. A JP Surfboards SUP Quad with a single large channel. Look at the cant and toe in of the fins. 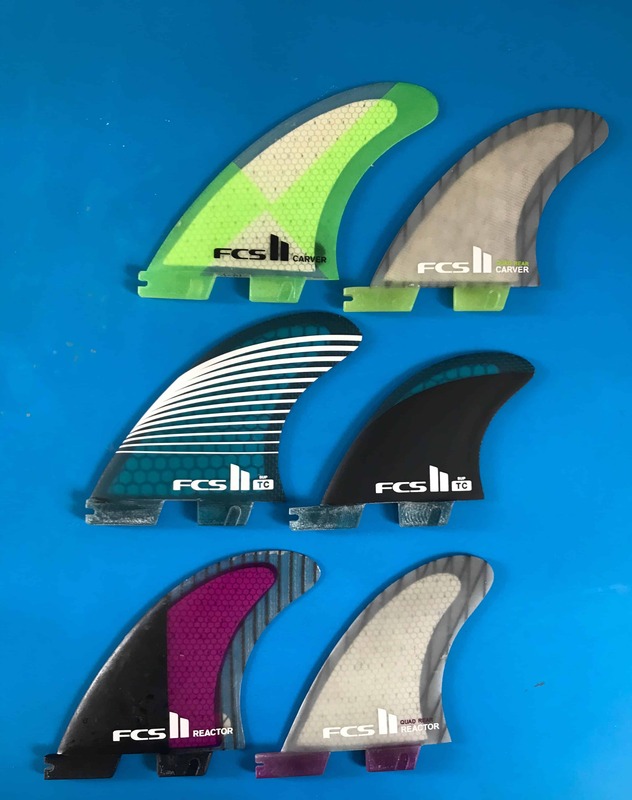 A selection of FSC II quad set of fins from top to bottom Performer, Tom Carrol signature and Reactor. Of course, as previously mentioned, it also depends on board design so please take this as a rough guide – experiment and see what works for you. 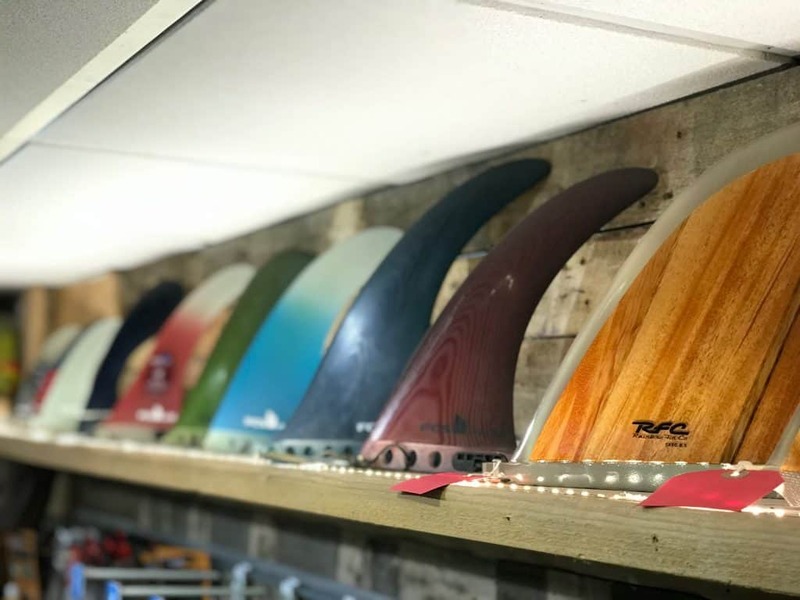 There is a wonderful selection of different longboard-style fins from the big pivot/keel fin if you are into noseriding, to the much more swept-back dolphin fin if you prefer a more radical new school longboard style. 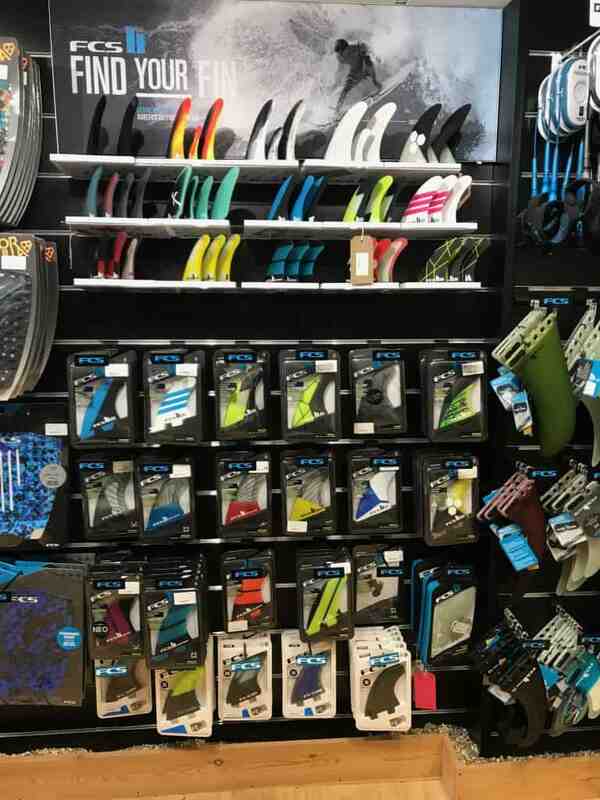 A fine selection of longboard fins. So fins also have a shape to them; a rake – how swept back the fin is and a foil – the aerodynamic cross-section. Generally the more upright a fin, the more slashy and tight your turns will be and the more swept back, the more flowing you will be. As always, it also depends on the rider’s skill and board shape. 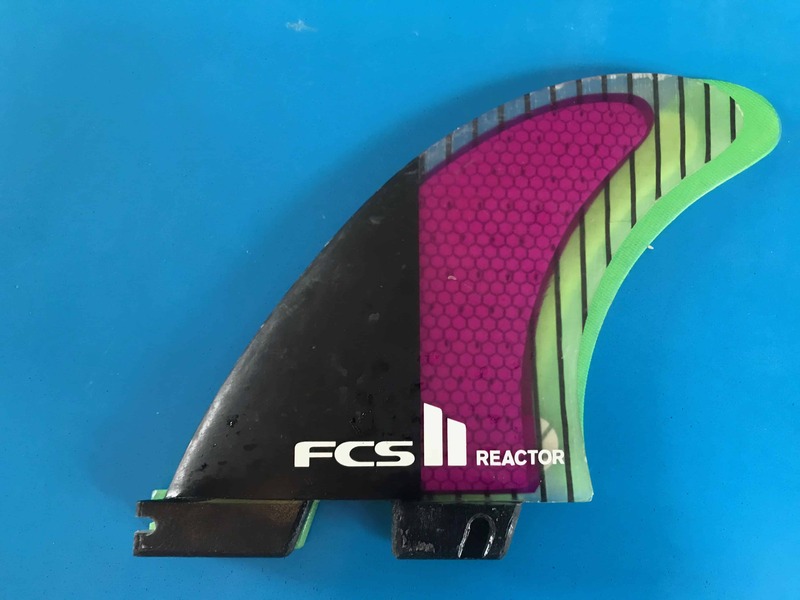 FCS II Reactor on top of a Performer fin showing the more swept back outline of the performer and more vertical shape of the reactor. Another consideration is how the fin boxes have been fitted to the board, ie are they at a slight angle to the centre line (toe in), are they absolutely vertical (90 degrees) to the board, or are they at a slight angle. The straighter and more vertical the fin, the faster you will go, but turning won’t be as easy. Most boards have a slight toe-in and the side fins have a slight angle off the vertical. In a thruster the centre fin is always vertical and in line with the stringer. Fin construction is another subject worthy of mention. Obviously the key here is to keep the weight down as much as possible, however having super-light carbon fins for surfing can mean the fin lacks the flex of fibreglass (flex can be help you push against the fin and slide the board around against the fins). Luckily there are fins with carbon bases and glass tops to get the best of both worlds. Cost will be a factor here, as the more space age materials you have in a fin, the more you pay. 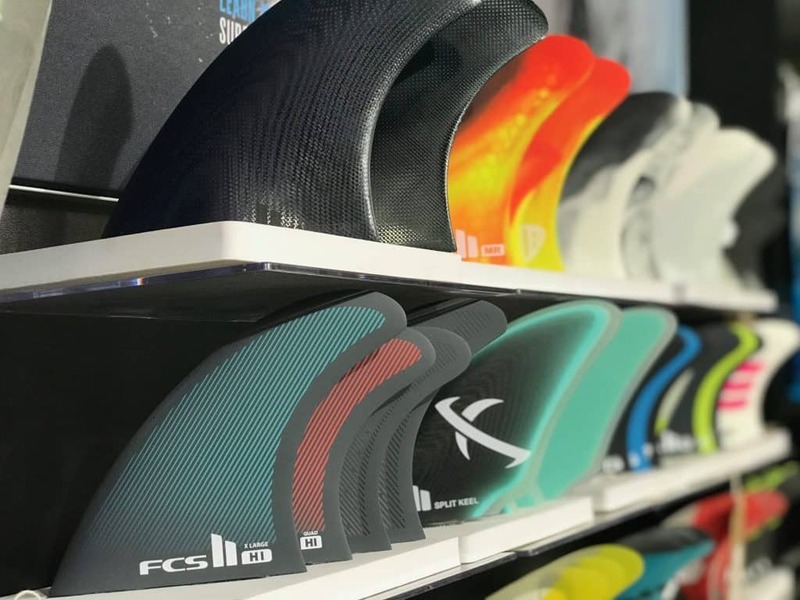 Get yourself down to your local store and have a browse – armed with the information here along with the seller’s experience of local conditions, you will be able to match the perfect fins to your board. Some shops used to have a demo scheme where you could try fins and pay a deposit to see which you liked…worth asking about. Still confused? Please feel free to ask a question on the facebook comment box at the bottom of this page and I will do my best to help. Surfed Out’s fine display of fins in Braunton, North Devon. Thanks to Surfed Out for letting me snap shots!